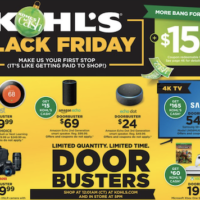 Click here to preview the Kohl’s Black Friday 2018 Ad! Doors open at 5PM on Thanksgiving with select deals live now but most deals will go live online on November 19th. Plus, use code CHEERFUL to save an extra 15% off your purchase or look out for the coupon in the ad! Just a reminder, Coupon Pro will be posting all of the HOTTEST online deals on Black Friday and Cyber Monday!